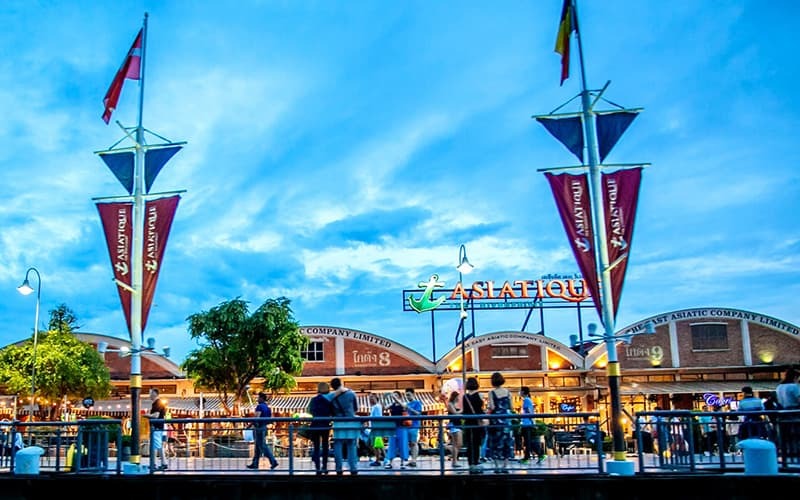 Set in a Colonial style is the Asiatique night market that plays host to over 1500 retail shops, restaurants and bars. This night market is not only adventurous and full of many delights, but also organized and easy to locate. There is a map available to serve as a guide to those visiting Asiatique Bangkok for the first time. There are retail outlets, restaurants and bars around. You can catch a Ferris wheel ride and also a puppet show. Asiatique is located in the riverfront and gives amazing views of the water and Bangkok's skyline. There is also a free tran service for those that want to get around. Asiatique is so organized that the area is divided into districts. This means whatever you need to find, you know where to go. You can often find different goods; fashion, electronics, etc. There is definitely something for everyone as the price ranges from cheap to high quality brands. You can find over 1500 stalls in the River market filled with everything you can ever imagine. The cool thing here is that you can beat down prices! The prices are not fixed meaning you can actually bargain with a seller to sell to you for less than the price that was initially set. You want international dishes? This is the place for you. In Asiatique, you can find over 40 restaurants, which is a long list of so many places to choose from. You can choose from Japanese, Korean and Italian dishes. You can also opt for Chinese, American, Thai and Turkish dishes. The sea food is definitely a must try! There are so many shows in Asiatique for your primary entertainment. You can get a ticket to the Calypso Cabaret where you get to see pop celebrities being excellently imitated. You can also find some of the talented locals putting on live shows. The ticket comes with a free drink or dinner depending on your choice. If you like colorful jazz music, you should try out this place. Another amazing show in town is at Muay Thai Live. For lovers of combat sports, this area is regarded as Thailand's most popular combat sport. It involves fighters wrestling to tell a story. It is really an exciting and blood pumping activity. You want a taste of a mini amusement park? The Ferris wheel, a large Ferris wheel known as Asiatique sky has air conditioned cabins and shows great view of Bangkok city and Chao Phraya River. The Ferris wheel can go as high as 60 meters. Visitors can catch a view of these great cities at night. You can also catch an exciting puppet show in the Joe Louis Puppet Theatre. This mixes modern choreography with ancient mythical Thai stories. This district houses small boutique shops for those planning to go shopping. You can find hand crafted products, jewelry, clothing and other souvenirs. You can also find the famed Calypso Cabaret show where you can enjoy jazz music and witness parodies of popular pop artistes. The Joe Louis Puppet Theatre is also located in this district. Here, you can catch a puppet show where puppeteers actively engage in mixing modern choreography and Thai mythology and create great and interesting stories from it. Here, you can learn about ancient Thai history and stories. This is a district for lovers of anything fashion. You can find over 500 shops that sells fashion products ranging from fashion designs, home furnishings and hand crafted products. You can also find the best gadgets and products in this district and at really affordable prices. Prices are not fixed and you can often find buyers and sellers haggling in a bid to beat down prices. This is where the foodies are majorly centered. There are restaurants serving anything Italian, Korean and Thai dishes. You can also find really delicious sea food in this district. The nightlife here is one of a kind. It features amazing rides and activities. You can catch a ride on the Ferris wheel to get a spectacular view of the city. You can also witness carnivals, festivals and other exciting affairs in the Waterfront District. Like home away from home, this district is a major site for popular food outlets like KFC. There is also a pizza company in the Town Square District; you can also find Au Bon Pain, MK and a large sports bar. There are also numerous cafés in this district. Getting to Asiatique doesn't have to be difficult. You can choose to take a car or taxi. Going by this means however, has the disadvantage of one getting caught in traffic. The most convenient way to getting there is by boat. There is a BTS Sky train that will take you to Saphan Taksin station. From there, you can easily walk to Sathorn Pier. Once you arrive at the Pier, you can then catch a free ride as Asiatique offers visitors free shuttle services from the hours of 4pm to midnight. The ride leaves every 15 minutes and moves along Chao Phraya River to drop passengers directly at Asiatique Riverfront. Asiatique is an interesting night market in Bangkok and you can find everything from cabaret and combat sports to numerous stalls and restaurants that serve really amazing dishes. You can also find international dishes here. It is relatively easy to get around despite its busy nature. You can find a map to help you get by from one place to another. Asiatique Bangkok is also divided into districts and each district has its own theme making it relatively easy to locate anything and everything. 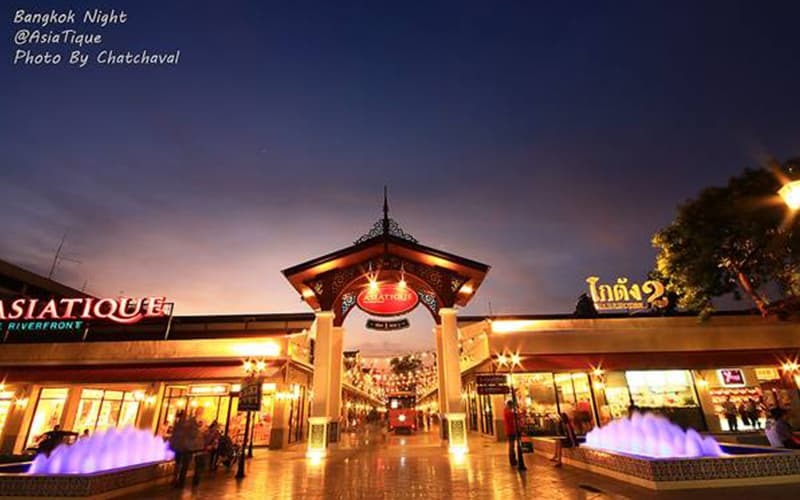 Although, it is rumored that Thais and foreigners have been charged differently and partially, Asiatique Bangkok still remains a site of major attraction and pleasure.